Survivor Rolando L. punched pleural mesothelioma in the face. After finishing his chemotherapy, surgery and radiation treatment in July, Rolando defiantly celebrated in August by riding his Harley-Davidson across the country, 2,200 miles in three-and-a-half days, to reach the infamous Sturgis Motorcycle Rally in western South Dakota. This was his victory lap. The war may be raging inside him, but Rolando won the first big battle. In his own irreverent way, Rolando, 59, has become a beacon of hope for many and an inspiration to all. 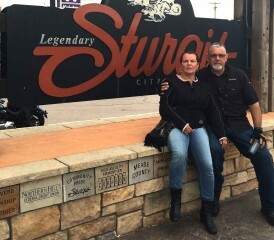 They saluted him in Sturgis at the famed Full Throttle Saloon, the epicenter for the annual event that attracts hundreds of thousands of bikers for a week of revelry. A cancer that one day may kill him was put in its place by a strong-willed rebel who refused to yield. He hit back with conviction. Rolando is a former Miami police officer who once pursued drug dealers aggressively in the ’80s, risking his life helping crush a notorious South Florida cocaine cartel. He almost died stopping a bank robbery that ended in a shootout. The assault weapon pointed at his head jammed, saving his life. Rolando was diagnosed late in 2014 and began chemotherapy at the University of Miami’s Sylvester Cancer Center. He underwent aggressive pleurectomy/decortication surgery in March with Dr. Nestor Villamizar, an innovative young surgeon who trained at Brigham and Women’s Hospital in Boston. Rolando finished his five-week radiation regimen near the end of July. Rolando rests in his bed after the surgery. He stood that day by the hospital bell patients ring to celebrate the end of their treatment. Rolando pounded it repeatedly before he left. On August 1, he miraculously left for Sturgis with wife, Susana, on the back of their Harley-Davidson. Another couple rode alongside. The chemotherapy had agonizingly nauseated him, surgery had shrunk and weakened a big man and radiation at the end drained him. But he still moved forward, determined that mesothelioma would not stop him. His commitment to ride across the country was strong, much like his work ethic. As a youngster, he worked in the family’s restaurant before and after school. He played high school football and worked in an auto shop on the weekends driving a tow truck, repairing brakes and pumping gas. He became a cop during a tumultuous time in Miami, and later worked as a long-distance truck driver. He was working in a warehouse, loading heavy equipment for a major manufacturer when he was diagnosed. He stayed on the job until the chemotherapy treatments overwhelmed him. It was the first time in his life he ever used a sick day, and it pained him to do it. Before he left the intensive care unit, he was asking doctors to accelerate his recovery so he could attend the next Miami Heat basketball game. He had walked the hospital halls endlessly with his walker tubes hanging everywhere. He grew impatient and refused to wait for a wheelchair when he checked out of the hospital. He hobbled to his wife’s car instead. She knew long before how tough and determined he could be. They had met where she worked, the same bank where he foiled the robbery. His heart was soft, but his will was strong. So off they roared, traveling an estimated 600 miles each of the next three days. When they arrived, he started taking photos: An endless sea of motorcycles, Mount Rushmore National Memorial, Custer State Park and the beautiful Black Hills. He texted the photos to his doctors and nurses in Miami. They were in awe but not totally surprised. They had grown to understand his determination. Although he didn’t walk around Sturgis as much as his wife and good friends, he bathed in the scene from his bike. Buoyed by the experience, they took the long way home, riding through Denver, Oklahoma City, Dallas and Baton Rouge before hitting Florida’s Turnpike and turning south. They arrived home just before midnight on Sunday. Susana was back to work Monday morning. Rolando slept for two days. He had attended the 75th anniversary of the Sturgis Motorcycle Rally. He slept with a smile. They had traveled 5,300 miles through 16 states in nine days on a Harley-Davidson motorcycle. He stood up to mesothelioma, and he stared it down.